BRISTOL - Max Pizza owner, Stelios Koutouvides, is aiming to continue to grow his business while trying out a variety of toppings to add to his popular pizzas. 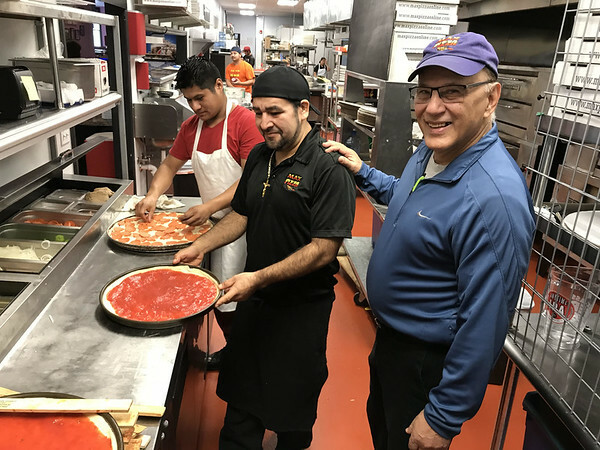 Koutouvides is the owner of six Max Pizza Restaurants, including Max Pizza VI in Southington, which opened in February, and his largest, “flagship” location, the 7,000 square foot Max Pizza IV, which opened in September at 454 Middle St. in Bristol. Koutouvides opened his first location back in 1976 at 108 Stafford Ave., naming the restaurant after a pet dog. Today, Max Pizza employs 100 people between all of its locations, 40 of which work at Max Pizza IV. However, Koutouvides is showing no signs of slowing down. Koutouvides said that, in the future, he also hopes to start bottling and selling his salad dressings and pizza sauce. Furthermore, Koutouvides intends to open an art gallery on the second floor of Max Pizza IV once it opens. He has been an artist for even longer than he has been in the pizza industry; painting ever since he was 14 years old. His paintings, which can be seen hanging on the walls at each Max Pizza location, vary from impressionism to realism. They portray people, landscapes, dinner settings and vivid nature scenes. Many of his animal scenes, he said, were created after taking safari tours when he was living in Africa. Koutouvides’ artwork can be viewed at stelsartwork.com. Koutouvides says that he has kept his pizza formula the same over the years because it is what his customers have come to love. However, while he has always kept the classic staples, he has enjoyed experimenting with toppings to suit every taste. Depending on the location, Max Pizzas also offer grinders, salads, dinners, appetizers and some locations even serve beer and wine. Max Pizza IV has a full bar including liquor. Posted in The Bristol Press, Central CT Chamber of Commerce, on Tuesday, 27 November 2018 19:52. Updated: Tuesday, 27 November 2018 19:54.